Welcome to Pullman San Francisco Bay Hotel, a prime destination for business travelers and tourists alike. The property stands on the shores of a tranquil lagoon, and its beauty inspires a refreshing ambience in every space- from the lobby and Scroll Bar Waterside Kitchen to each spacious room and suite. For business or leisure, impeccable service and thoughtful amenities make every stay a success. The hotel's elegant and stylish guest rooms and suites offers the best of the Pullman experience, with a desk, broadband Internet access, an LED TV, a Keurig coffee machine, C.O. Bigelow New York bathroom amenities, feather pillows and more. Join us for a memorable waterfront culinary experience at Scroll Bar Kitchen. The locally inspired seasonal menu, creative cocktail offerings and unmatched hospitality provide the recipe for a great experience. 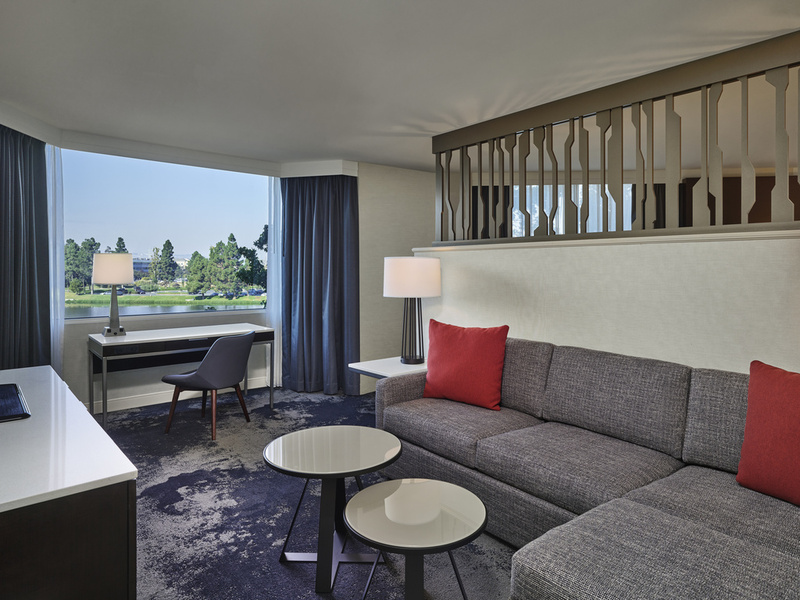 Scroll Bar is one of the hottest spots in Redwood City offering waterfront views throughout the lounge area. Experience signature cocktails while visiting with colleagues, friends or family. I stay with Fairmont multiple nights a year and due to the Accor acquisition, Pullman became an option that I didn't know about beforehand. All my stays there have been short and sweet and even a few pleasant surprise upgrades for my stays as well. The gym is well equipped and the hotel is very convenient for the airport. The staff is always courteous, helpful, and professional and I look forward to coming back. my room was next to the elevator and I could hear it during most of the night; this was disturbing. Welcoming staff, quiet and clean rooms. Restaurant and bar service could be improved, and parts of the hotel room eg the bathroom sink area, light and power switches, desk are in need of a refresh. It was fine. I was there Monday-Friday and the room never cooled down, the shower took about 20 minutes to warm up, and one of my socks went missing. I’m convinced the room cleaning service accidentally picked it up with one of the towels or something. There were problems with my room: the water in the shower was rusted. The tub clogged after a routine shower. The lights bulbs were dim. There were some positive aspects to the room. The bed was very comfortable. I could adjust the heat. The safe was large. The room was clean. Overall, the staff were inattentive and slow. I waited on the telephone for over 30 minutes to make my room reservation. I asked three different people to be put on the list for the shuttle to SFO and was never placed on the list. I sat at the bar for 15 minutes before anyone even asked whether I had been served. I've always enjoyed my stays at the Pullman but a consistent area I'd like to see improved is the bathroom. They're clean, but the towels feel like sand paper against the skin and the showers seem to have drainage issues. I was first placed in a noisy room near the elevator. The hotel agreed to move me, and offered to run up with the new key so I wouldn't have to go down to the desk, but it took Quite Some Time for the new key to come up. The room was nice -- comfy bed; good water pressure in the nice, hot shower; room was clean. A small Keurig in the room was a nice touch; I had to run it three times to clean out the dregs of whatever was in there first. Housekeeping did not always replace the coffee cups. Very few amenities in the hotel: a restaurant/bar (overpriced) and a small coffee shop which also sold a few necessities (also very overpriced). I'm told there was a fitness room; no spa. Staff seemed nice but not always competent -- there was a shuttle to the airport every hour which took only 9 people (not good when a large convention gets out all at once) but nobody (the desk, the bell staff) seemed to have a procedure in place for reserving one of the cherished 9 spots on the shuttle. Our meeting had a buffet breakfast each day -- cold scrambled eggs and dry bacon. Full marks to the reservation agent, though; she was terrific in changing my reservation. Hotel was clean, comfortable and in a very nice location. I stayed here for 2 nights for a conference that took place at the hotel. Easy, convenient location. Staff was courteous and greeted us at the door, opening the door for us each time we walked in and out. The parking lot is right outside, just steps from the front entrance. Check in went smoothly and the room was a nice size, with a comfortable bed and curtains/shades that blocked the sunlight out for a good night's sleep. The food at the bar was tasty and reasonably priced and the servers were professional. The hotel had a nice, classy, peaceful feel to it even with all the people who were there for the conference. It's a place I would recommend for either business or pleasure. Nice facility; all staff except for the desk clerk at check-in and the bar staff were extremely friendly and courteous. Very nice. The bathrooms need cleaning attention. The door and the wall were dirty, particularly the bottom half. Great hotel experience, miserable shuttle van experience. Everything at the hotel was first rate, and the staff was very helpful and accommodating. Your hotel confirmation email stated you have a shuttle to/from SFO. I arrived at SFO and called the hotel, and was told the shuttle would pick me up in 15 minutes. Without bothering to tell you about my several phone calls and the &quot;excuses&quot; I was given, the bottom line is that I stood waiting in the outdoor hotel pickup station for 55, yes, 55 minutes. Later, I learned that the shuttle leaves the hotel every hour, on the hour. Very disappointing. We arrived A little after 3 pm on a Saturday and much to my surprise I was randomly selected to be the Special guest of the day it’s a reward program that Pullman has for guest they randomly select a guest and upgrade them to their best suites and we also received 2 complimentary drinks for the bar, this has been by far my best experience with any hotel I absolutely loved it! Will definitely be booking here again without a doubt!! Super clean friendly and professional. Everyone I ran into was helpful, kind, courteous, and respectful. Bar is always great Check in was easy There was yucky mold in bathroom and the paint needed refreshing. Room was comfortable Check out line was long and only one clerk at the desk, therefore no elite service.